My chainplates arrived during the week, so I set about attaching them. The mob I bought them from, classic boat supplies, were out of 1/4" countersunk bolts so I substituted 5/16" ones. Anyway, these puppies aren't going anywhere. 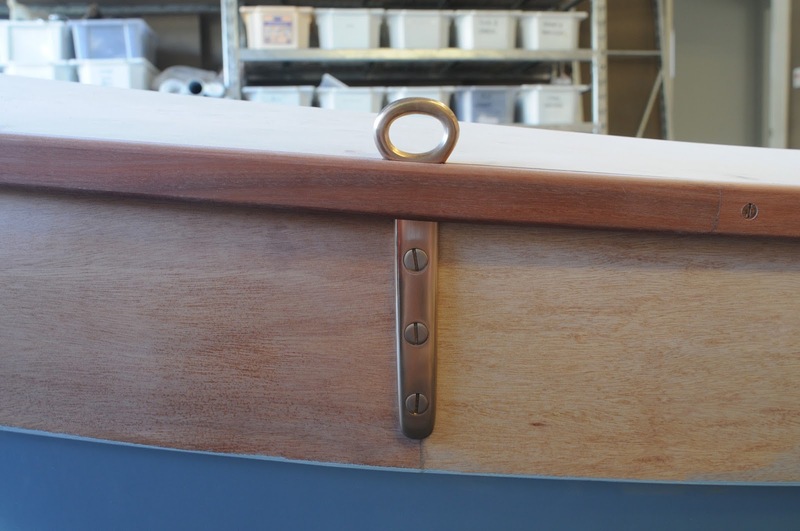 They go under the outer gunwale, in a slot machined specially for them. 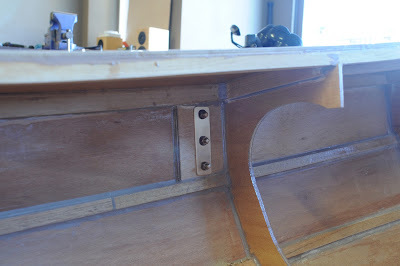 I drilled three 8mm holes through the hull on 45mm centres, and passed the bolts straight through. I even polished up the bolt heads. They're beautiful castings, and solid as a rock. At this point in the plank there's a doubler under the hull, so it's 12mm thick rather than 6mm. 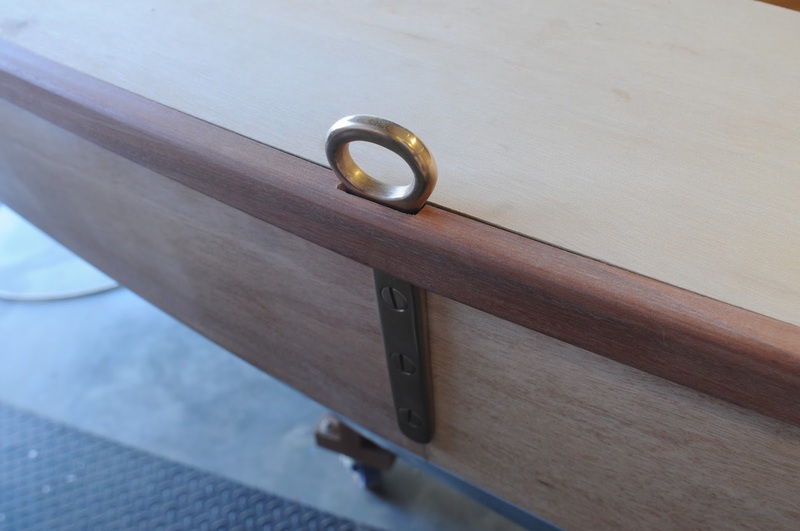 To spread the load a little I machined up some 2.4mm thick bronze plates to go on the inside, so the hull is clamped between chunks of bronze and the bolts can't possibly tear through. 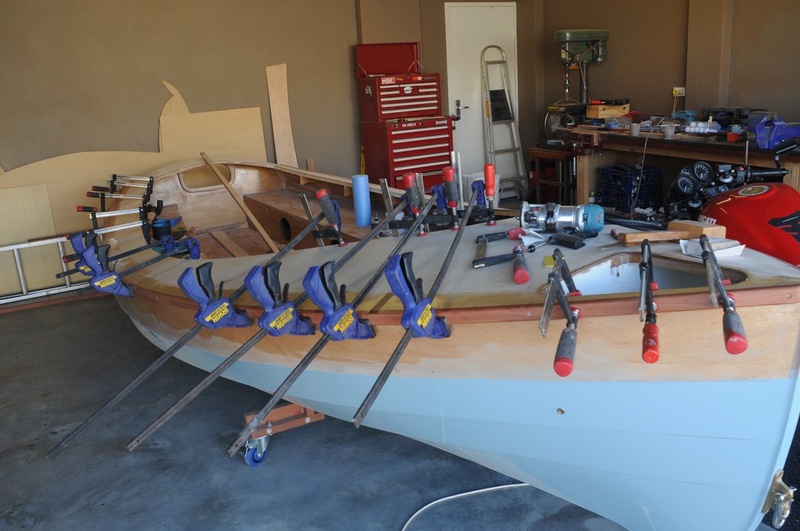 If the load is big enough to take the chainplate out, quite a bit of hull is going with it. Now that the detail is sorted for the gunwales, I epoxied them in place. I put a bunch of clamps on in addition to the screws to ensure there's no gaps. Here's a photo showing a lash-up of my proposed shroud attachment. The holes in my chainplates are big enough that I think I can do away with deadeyes or blocks on the bottom, and just use the chainplate as a deadeye directly. I run a 6mm line up through a little Harken 29mm double "carbo" block, which weighs nothing and has no metal in it. I can splice the end of the shroud directly to the block. Here I've just tied it to a length of 4mm braided rope. The other end of the 6mm line goes aft to a 100mm bronze cleat. This is probably massive overkill, but I have a bunch of these kicking around having decided to go for bigger ones in the spots I bought these ones for (halyards and mooring lines). In any case, playing with it here it was really easy to set up and adjust the shroud tension. 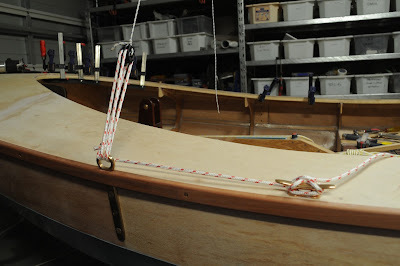 I imagine it will make stepping the mast quick and easy, and plan on doing exactly the same setup for the bobstay. IMHO 3mm spectra will suffice for the lanyards and you may regret the cleat. Every time you tack the jibsheet will attempt to wrap itself around the cleat. The lanyard will hold with some turns around itself and some half hitches - I use this setup on the forestay of a Hartley TS18 and it works perfectly, very strong and no stretch. I replaced the lanyard after 5 seasons when the outer covering started to show signs of wear.